Vigan is one of the most visited city in north of Manila. Along with Baguio, Baler and Sagada, to name some, it has sweet spot in the Philippine tourism map that is frequented by local tourist. Why not? Everybody wants to walk and feel back in time on the cobbled streets of Calle Crisologo and the Spanish and American Colonial Houses located in the while city. Good thing that local government of Vigan is working to preserve its more than 600 heritage houses. No wonder why it was declared a UNESCO World Heritage Site in 1999 and fifteen years after, just recently, it was included in the New 7 Wonders Cities. Last year before the city was included in the voting oriented New 7 Wonders Cities, we were able to visit Vigan for our random and unplanned travels. We hop the bus in Cubao, Quezon City at past midnight and arrived in Vigan at around 7am. My travel blogger friend based in Vigan, Edmar of edmaration.com was kind enough to recommend reserve a hotel for us. Henady Inn is in front of the Vigan arch and is minutes away from the center of the city where most tourist spots are located. Buses from Manila and Ilocos Norte can throw you in front of Henady Inn's door. 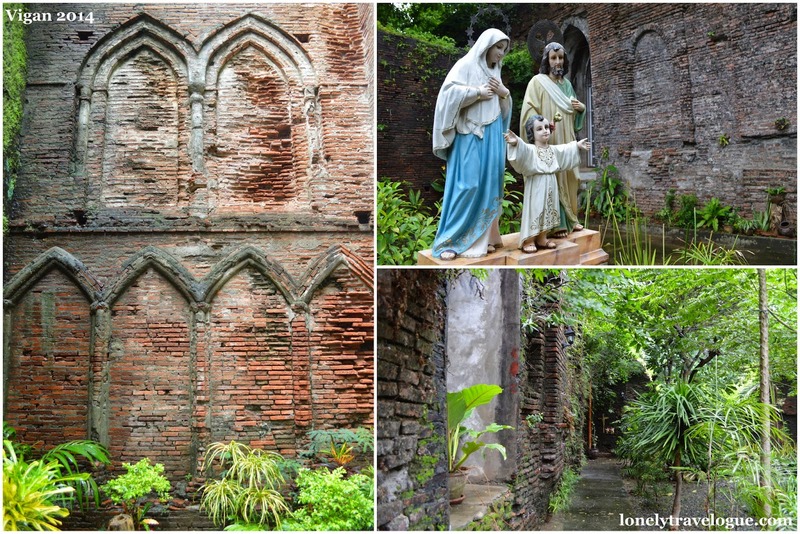 After we had some nap in Henady Inn we cannot escape the excitement of walking towards Saint Augustine Parish Church also known as Bantay Church which is actually a few steps away from the Henady Inn. I've been in Vigan four years ago after my college graduation. I immediately noticed the changes in the front yard of the church which is actually good because parking space is now properly placed. The brick facade of Bantay Church is of Neo-Gothic design mixed with pseudo-Romanesque. It is best to take picture of the church during the afternoon as the sun illuminates the face of the church. Walking around the church, you will see the old and untouched walls of the church and its surroundings developed into a hiding place for the spiritually weak that needs to hear the voice of God through nature. Bantay Belfry of more commonly known as Bantay Tower in just beside the church. However, we skipped it as we were planning to climb on the hill for the sunset. 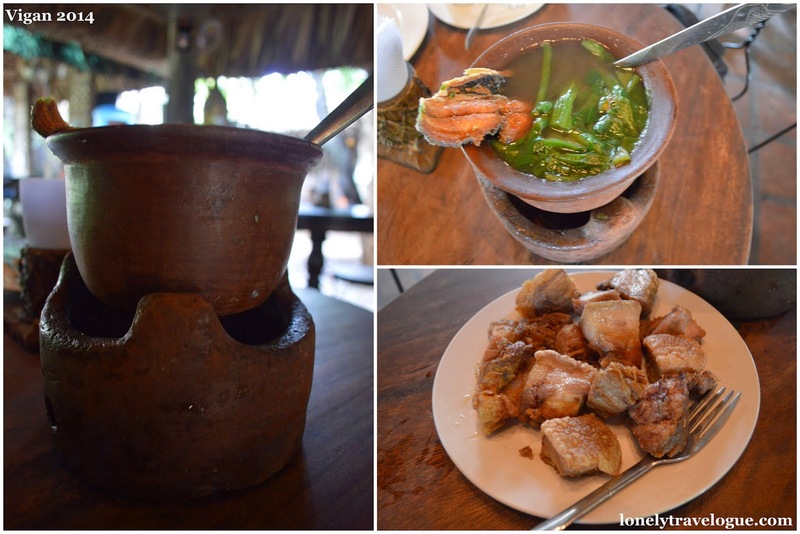 After the Bantay Church we decided to have a lunch in Hidden Garden Lilong and Lilang Restaurant. The restaurant is 15-20 minutes away from the city center and we paid like PhP50.00 for the tricycle, one way. Aside from the authentic Ilocano food that this restaurant offers this place also showcases Filipino culture through its use of native tables, chairs and other furniture. They use sawali ceiling which is very Filipino. These somehow reflects the history and arts of the Filipinos. Burnay or Jars are scattered in the restaurant as a display and for actual use. 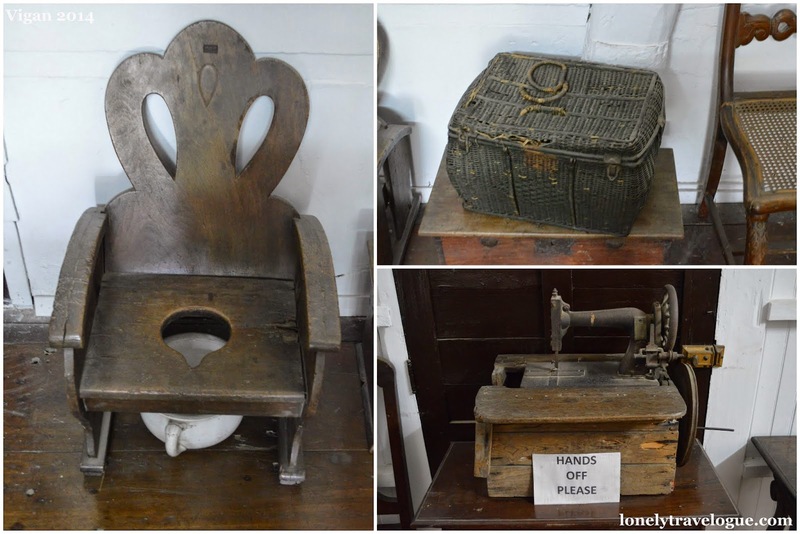 They also displayed some items that is used to be a normal household items before just like this sewing machine table below. Miss Lingayen did enjoyed the food that we ordered because she is from Pangasinan ergo she loves eating vegetables and fish. Me, I enjoyed the crunchy Bagnet. The Katipuneros! I mean the host. You know what is this... and its stylish. Overall, this restaurant deserves a place in your itinerary not only of food but of the place itself. You can just hop a tricycle and and tell manong driver to bring you at Hidden Garden. They know the place for sure. Not far from Hidden Garden is the Pagburnayan. One of Miss Lingayen's frustration is pottery so I will get killed if we skipped this. Burnay is a local term for jars. This craft dates back when the Chinese and Japanese traders reached the shores of Ilocos. It was the Chinese who introduced the technology of pottery to the town folks of Vigan. One of the descendants of the immigrants who introduced pottery is continuing the art of pagburnayan through the use of skillful hands of the craftsmen using the manual pottery wheel. Burnay is used for tea drinking, and as container for salt, brown sugar, water, local wine (basi) and bagoong (fermented fish). Nowadays, some people use this for storage for drinking water. They say that water will keep its coolness when stored in a Burnay or Jars. It also now being use as decorations in the gardens just like what we saw in Hidden Garden. This local craft like the pre-colonial trades reaches the shore of Europe as a major export products. According to the artist (I call them artist yes) whom I talked to in one of the famous Pagburnayan in Vigan, some of the pots they make is used locally to produce salt. Those pots above is for baking. And after baking they will crush it and put it in a salt farm (I do not know if its in the ocean). Tourist may also try the art of Pagburnayan for free - like what we did on above pictures. You just tell the personnel that you want to try and they will gladly assist you - for a tip. Later on you can buy your works of art after days of drying and baking. If you cannot wait, you may buy a souvenirs readily available for as low as Php20.00. Father Jose Burgos as we know is one of the GOMBURZA - the tree martyr priest who were executed though garrote by the Spaniards. He was accused of supporting the Cavite mutiny and was executed in Bagumbayan, the same place where Dr. Jose Rizal was executed. Today the birthplace of the celebrated priest is now a satellite Museum of the National Museum. Father Burgos Museum collects a minimal fee upon entering for maintenance. Inside the house turned museum you will see memorabilia of Fr. Burgos' family and descend. 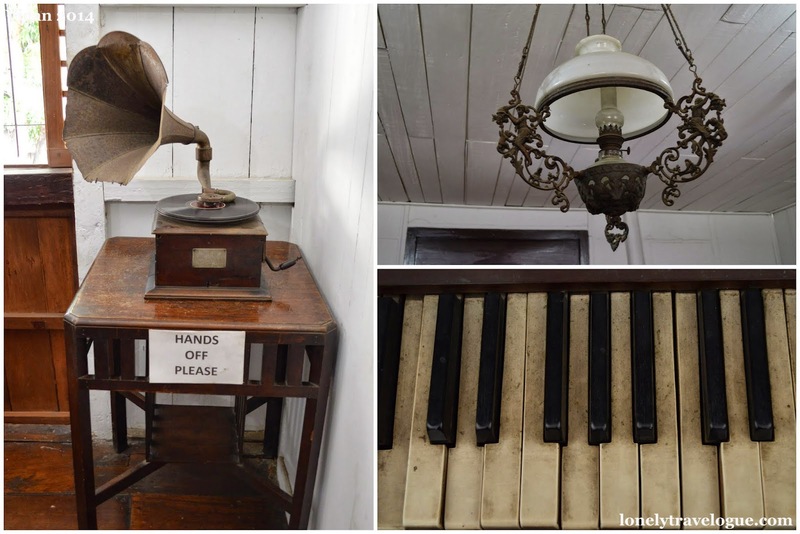 Priceless antiques - from musical instrument to lamps - are well kept and are available for us to see. Though dust are very at home in the house you will still imagine the glory of the house during its golden years. Looking these priceless antiques, I could imagine how Jose Burgos lived during his childhood. They are well off I could say. They have the finest furniture. They even have a piano which I think was a status symbol. Walking distance from Father Burgos Museum is the UNESCO World Heritage Site Marker. Vigan was listed in the UNESCO World Heritage Site December 2, 1999 because of well preserved Spanish and American architecture which were build in the 18th century. Most of the tourist spots in Vigan is located in the city center. After our Father Burgos Museum tour we headed to Capitol Building. In front of it is a large park dedicated to the founder of the Vigan, Juan de Salcedo thus Plaza Salcedo. During my first visit the huge park is dedicated solely for strolling and for children and youth who wants to play. I was surprised that they build a big fountain in the middle of the park. The dancing fountain which entertain locals and tourist starts at 7PM, occupies almost the entire Plaza Salcedo. Commercial establishment within the specifies radius by the local government cannot build a modern structure in the city center. It has to follow certain design to maintain the image of the city. I find these structures nice and very inviting. Right in front of the Plaza Salcedo is the famous St. Paul’s Cathedral is also known as the Vigan Metropolitan Cathedral. 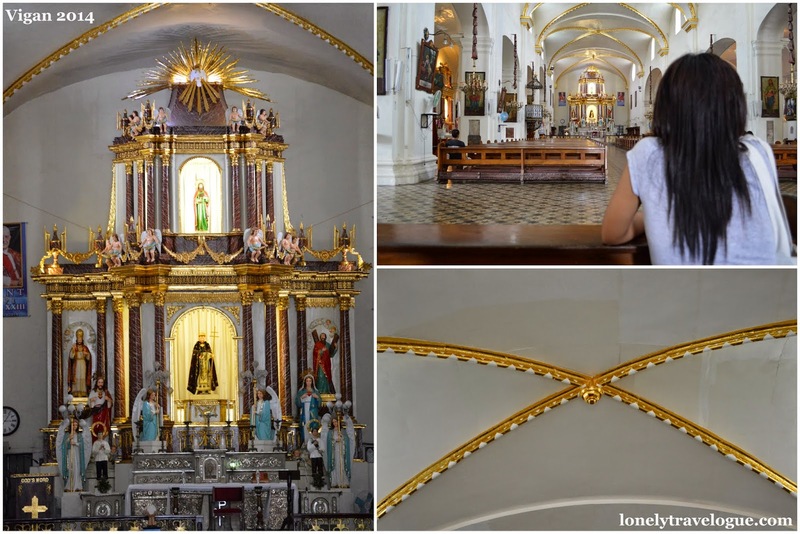 The church is one of the major landmark of Vigan City along with Calle Crisologo. 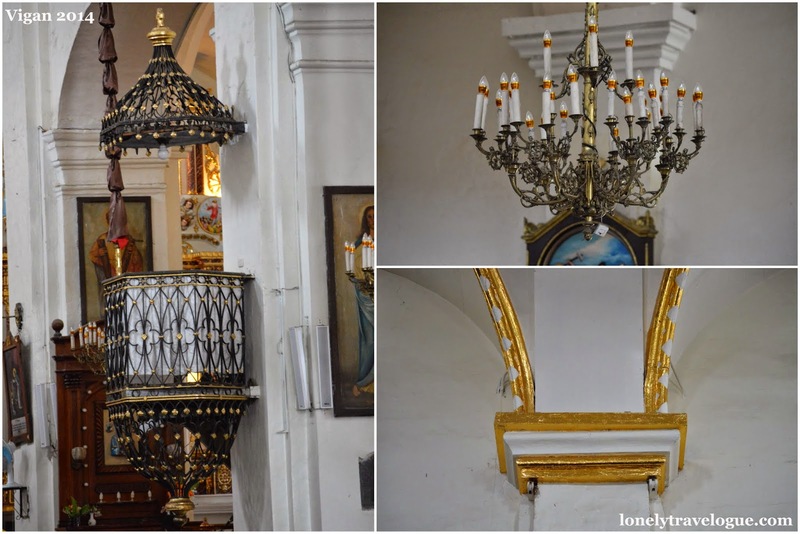 The baroque architectural designed cathedral is earthquake proof and has an impressive interior of gold cornice in pure white painting. Right beside the Vigan Metropolitan Cathedral are food stalls serving the famous Vigan Empanada. Its meryenda time Vigan style! For as low as PhP50.00 per person you can have a full tummy of Vigan's local delicacy that is being replicated by businesses in the Metro. But hey, nobody beats the authentic Vigan Empanada! Vigan Empanada's main ingredients are Vigan Longanisa (Vigan Sausage), egg, bean sprout, carrots and cabbage. Fried in wrap sticky rice wrapper, it is best served with vinegar aside and ice cold softdrinks. 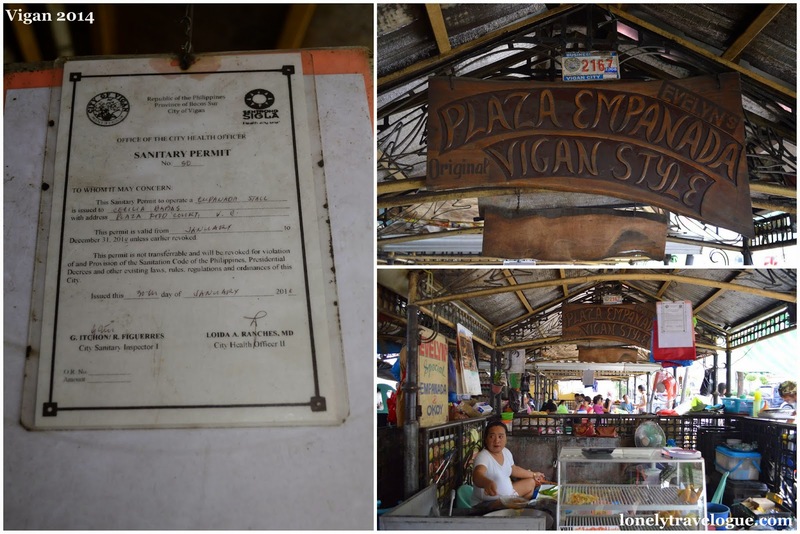 Vigan Empanada is testament of Ilocano's love of vegetables. While waiting for your Vigan Empanada or if the queue is long you may want to walk around and have friends with the locals in Plaza Burgos. When we entered Calle Crisologo - the most famous street in Vigan or even in the entire archipelago my camera shut down. The battery was empty and I do not have a spare. What?? But it was the most nostalgic moment of my Vigan tour. I got to appreciate the cobbled streets full of tourist with all my heart. I just stared at each houses, touched the old walls while remembering the old times in our history. I did not mind if I do not have pictures of the famous street in Vigan because I was enjoying the moment. Oh well when we reached Syquia Mansion, my camera worked again. I dried it in the sun like we used to do when we were kids...joke. Anyway it worked but I had to minimize the use for our last stop in Bantay Bell tower for sunset. 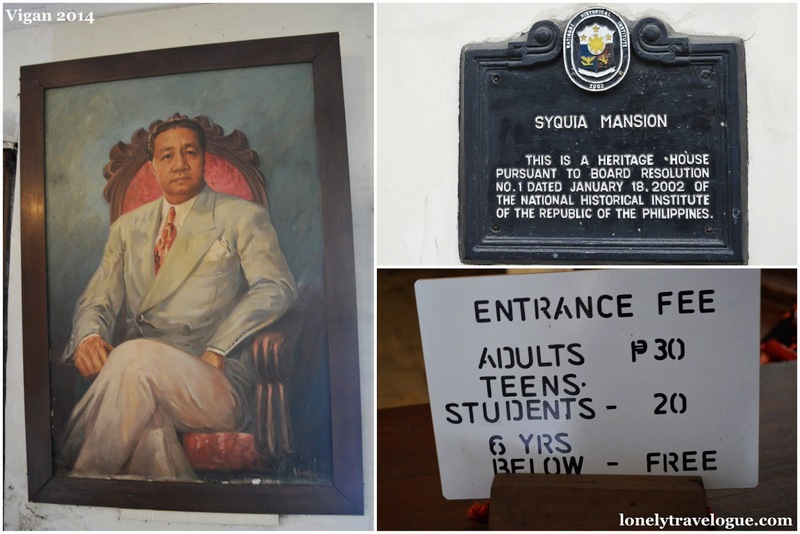 Syquia Mansion is the Ancestral house of the late president Elpidio Quirino. 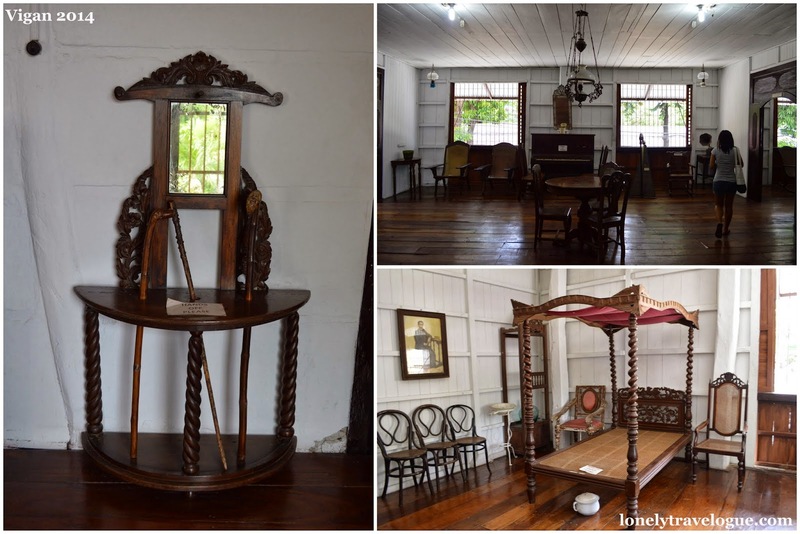 The mansion unlike the Burgos Museum is a private property and is manage by the descendants of President Quirino. The house actually is owned by the wife of Preident Quirino, the first lady Alicia Sy Kia Quirino. Thus the name Syquia Mansion. Her wife is of Chinese decent that made fortune in trading business. 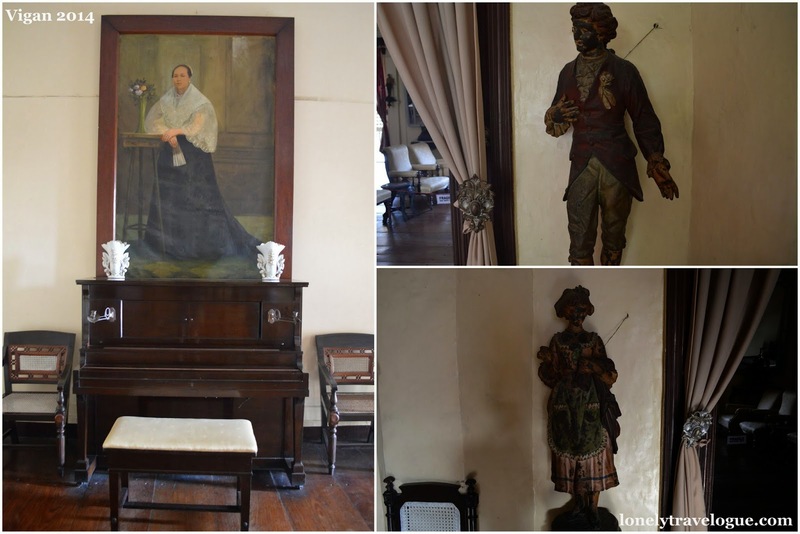 Syquia Mansion has an extensive collection of fancy antique furniture. The house is well maintained and clean thus truly reflects its golden years. It was around 5PM when we went out of Syquia Mansion and my thought was.... SUNSET. 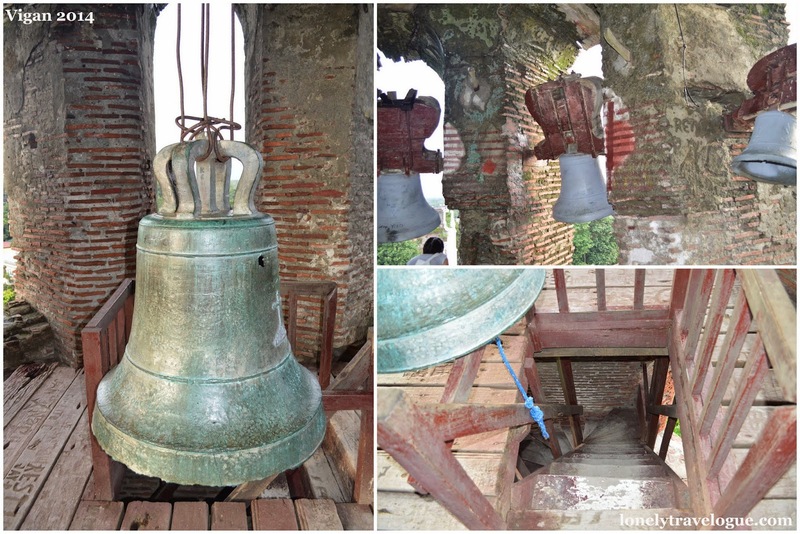 There is no better way of watching the sunset in Vigan than the Bantay Belfry way. So we rushed to climb the hill to wait for the golden hour in Vigan. Luckily we were the only sunset spectator and unluckily the clouds hid the sun. Better yet appreciate the view of Vigan from the tower while the wind touches our face. We planned to go back to the city center during the night to watch the Dancing Fountain in Plaza Salcedo. So after some nap we hailed a tricycle we were amazed by the colors of the night. In foreign tune, the waters danced with the light. The show wasn't bad. But I would appreciate it more if local music was used. It was a good attraction though. The site wherein the heroine Gabriela Silang was executed now serves as a main tourist attraction in Vigan. Before we hit again the cobbled streets of Calle Crisologo we had some light dinner in the historic Cafe Leona. This restaurant occupies the lower floor or silong of the ancestral house of the prolific poet during the 17th century Leona Florentino. It is rare to see Calle Crisologo a deserted street. As I have said this is the most famous landmark in Vigan. Souvenir shops are here because tourist are here. To see the street deserted is seeing its soul. You have it in your own in your own pace. No obstruction. Its romantic to walk in the cobbled streets of Calle Crisologo during the night. Where lights is on, you can hold hand while walking, not saying any word just staring at the old houses (no horror please). Let your heartbeat speak the love - the way of the past. You can take pictures anytime at any place. You can sit or lay on the famed street and have a good fun memory. In the morning its walk back in time! Again in the earliest that you can call the morning, the street is yours. 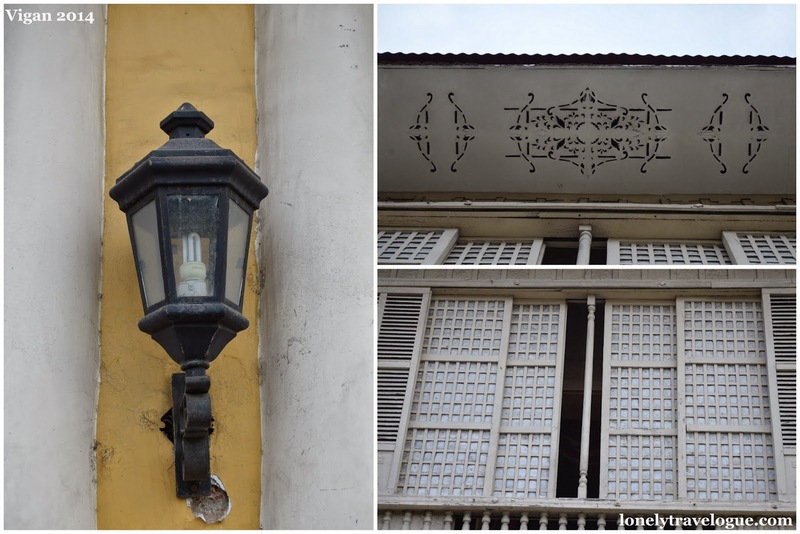 See the soul of Calle Crisologo. It has life speaked by it history and soul. If only cobbled stones can talk I bet we will listen with all ears. Traveling is learning not in the four cornered walls where we were confined for 15 years. Its history itself speaking to us and if we only listen we will dig more. We will be impressed by our story crafted by our folk that we need to re-tell and preserve. Do not just be amazed by the cobbled streets of Vigan but learn that we have to take pride of what we have. It does not stop there, we have to preserve in order to re-tell the beautiful tale of the Filipino people.